Come visit New Age Automotive Svc Llc. in Mt. Holly and Gastonia! We are proud to specialize in Auto Repair. As the premier auto repair shop in Mt. Holly and Gastonia, our highly-trained automotive mechanics take great pride in supplying: Engine Repair, Brake Repair, Towing and Wrecker Service, and Auto Electrical Service. Each of our reliable specialists undergo extensive automotive repair training to meet all your auto repair needs. The owners and maintenance experts of New Age Automotive Svc Llc. have been in business for 7 years, we are honored to bring years of automotive experience to the Mt. Holly and Gastonia area. While we focus on Auto Repair, Engine Repair, Brake Repair, Towing and Wrecker Service and Auto Electrical Service, we also provide a long range of other auto repair services listed on our services page. Our auto repair experts have built our reputation by providing consistently superior service here in Mt. Holly and Gastonia. No matter what your vehicle needs, come see us at New Age Automotive Svc Llc. today! From Brakes to transmission to engine work, we are the best one stop auto repair shop in Mt. Holly and Gastonia. We provide trustworthy, fast, reliable, and quality work at the right price. Dont just pass through; come see us for any of your auto repair needs. "Russ, the owner and chief mechanic, has always resolved every problem I have brought to him and in a timely manner." "Have had them to work on my truck twice now ...great quality work and do exactly what they promise"
"The team at New Age Automotive did a great job on my car and had the best price in town! I will be going back for any further service that I need and would recommend taking your vehicle to New Age Automotive." "Great customer service. Service for car repair is reliable." "Russ and Dawn are genuinely friendly and knowledgeable about automobile mechanics. Russ is very thorough in trying to diagnose car problems presented to him. Dawn will keep you informed on what is going on in a timely manner. They go out of their way to make sure you are a satisfied customer! We have recommended this shop to others and recently received a thank you from a dear friend for recommending them!" "Had a great conversation about the problem I was having and they took everything we talked about into consideration when addressing my needs." "Thank you for doing a good job"
"excellent work, friendly and knew how to get to get my old truck running right again! I have a 95 chevy 1500 and it pre computer diags so knowing what your doing counts!" "Russ does excellent work. He's very efficient and precise. His prices are very reasonable." "I would highly recommend New Age Automotive Svc Llc. William and Dawn were both friendly and knowledgeable of my Saab vehicle that I purchased from my brother. My brother, Vernon Harris told me that New Age Auto had always serviced the vehicle and was great at doing so. I enjoyed talking with Dawn, she's really cool and I was very impressed with her vast knowledge of the automotive industry." "Good on both spectrums as well as knowledgable. I was provided with timely information on the next steps needed to complete the repairs along with a scheduled follow up call to discuss the options." "At my best friend's recommendation, I left my car to be diagnosed after the initial screening. I called 3 times at interval and left a message for him to return my call. He did after I had called Billy's BBQ to see if his shop was opened. He cussed me out & said someone from the restaurant came over to tell him about it. I didn't ask the person to go there to tell him I was looking for him. Not only was he rude,he doesn't honor his promise. I regretted that I ever came to his shop." "First off, let me just say that when Mr. Perez brought his 1988 Pontiac Firebird to our establishment, the vehicle had multiple issues, such as surging at idle, cutting off, and long extended cranking time, to just name a few. Mr. Perez had 3-4 other people working on his vehicle, prior to me. Mr. Perez said he was not sure they knew what they were doing, including replacing a timing chain, that he was sure was not done correctly. I told Mr. Perez he would need to leave the vehicle with me, as it may take a while to go over what the other people had done to make sure the work was performed correctly. Mr. Perez continuously called for updates, over and over again. I told Mr. Perez that I would contact him, when I had an update for him. We are a busy shop, and I call to update when I can tell them something new. I did call Mr. Perez and advised him the distributor shaft was bad, and needed replacing, and would check fuel pump after the timing was correct. Mr. Perez call on the 23rd, and I missed his call, as I do from time to time. When I get to freed up, I check my voicemail, and return calls. I did not give Mr. Perez a timeline as I had to recheck all his previous work performed by unqualified people. The car was here for a total of 6 days, and two of those days was a Saturday and a Sunday. I had 4 working days to do the impossible. As for the slander of me "cussing" Mr. Perez out... that is a total fabrication. All my customers know that is not my personality. I am never rude, nor do I cuss people out. I was very professional, as I always am with all my customers. That is slander to make his post seem to have some merit, but it never happened. His best friend, that referred Mr. Perez to me, told me that Mr. Perez has been trying to get these same issues addressed for close to a year, with multiple people working on this vehicle, with no qualifications. So, how Mr. Perez thought I could fix it and check out the other work in a day or 2, I do not know. I am sorry Mr. Perez feels the way he does, but I do not feel New Age Automotive has wronged him in any way, in fact, we did not even charge Mr. Perez for the hours of diagnostic time I put into trying to address some of the many problems with his vehicle. I would like to say New Age Automotive Services always tries to satisfy every customer, but you cannot satisfy everyone." "High quality work at a reasonable price with friendly service." "They are honest people and truly care about the quality of their work. New age automotive is a great place to go for any car problem." "I found you business by accident several months back. I was very pleased with your assistance then and now. I will continue will your services & will recommend your services to others"
"Russ was able to diagnose and fix problems with our car that other repair shops (including dealer) we've been to were not able to. Thanks Russ." 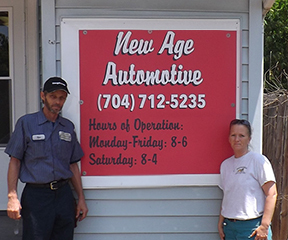 "I would recommend New Age to anyone looking for an auto service shop. Very helpful and knowledgeable." "Exceptional customer service. Quality work." "The owners are genuine people who are honest and hard working. This is why we drive from Charlotte to Mount Holly. We have been with them for at least 3 years and do not plant to change mechanics." "You will receive an honest assessment of your vehicle and quality service." "Top Notch. Russ and Dawn are as honest as they come. They also take the time to explain to you any issues with your car and what they will do to remedy them." "I have always ben satisfied with the service and repairs." "Excellent work, quick service times, and Russ will go out of his way to find you the best price available"
"It's Great, a Company that truly cares." "New age is # 1 in customer service as well as number #1 in work on your car." "Russ will listen to your issue then do a through diagnosis and explain what he believes the problem is, how to fix it and the cost. He does quality work, in a neat and timely manner. Russ and Dawn really care about doing the right thing for their customers." "Russ and Dawn are wonderful. They take their time to explain the issues at hand. They are fair with their prices. They will work with you to ensure your vehicle is 100%. They have tow service which is great and convenience." "I would recommend them to friends family and associates"
"Very nice, honest, salt of the earth people. They went above and beyond to take care of my automobile." "Problem is determine in a timely manner, repairs complete accurately and you will not find better customer service." "that if you want someone working on your car that is very knowledgeable and honest, then New Age is the place to go!" "This is a really great shop and the people here are very honest. My boyfriend brought my car here a few months back to get brakes done I later took my car to the honda place for an oil change months later and they told me I needed brakes, which I knew was impossible since my brakes were still fairly new. I brought my car back here to the shop to have my brakes checked and they told me I didnt need brakes when they could have just sold me brakes since that's what I thought I needed. They educated me on my car and a few things that I did not know and they are very warm and welcoming people. I had a great experience here and I trust them I will continue to have them work on my car since then they have put tires on my car and fixed other things for me. This is where I will be coming for all of my car needs from now on"
"That I am very satisfied with your service. You have done very good work in my car. Knows right away what the problem is." "Russ is very knowledgeable with working on automobiles and Dawn provides great customer service." "I have shared that I had a great and experience and it was very comforting for numerous repeat customers to come in for service while I was waiting. Before my visit, I had called months prior and received a quote over the phone which was honored at my visit. He even did one other minor repair for me so that I could get my vehicle through inspection and changed my brakes as well and I was still finished in the time frame that was quoted." "I would tell them ross is a great mechanic." "This shop does it's best to get you done in one day and tells you if it will take a number of days for parts to be shipped before starting the day"
"They do a good honest job." "They did a wonderful job for me on a simple issue. and, in a timely and very friendly customer atmosphere. I will always go there for ant of my automotive"
"Russ is the best mechanic I have ever dealt with! He's thorough and explains things clearly and makes sure I understand what he's explaining. His tech Tyler is great also! I live in Charlotte and drive to Mt Holly to have my van worked on. I bought my van for cash and Russ has it purring like a kitten. He's been the only mechanic since I bought it and will always be! Dawn and Russ are good honest people who care about their customers." "Will not be going back due to fact that feel taken advantage of . Got 400 dollars worth of work done and I paid almost 800 and now I have new problems with my vehicle that weren't there to begin with then tried to quote me $170 for spark plugs wires 2nd quote of $119plus tax Russ Special lol I drove to AutoZone paid $37 and snapped them on myself saved myself $100-$150 almost ! FYI seemed to be GOOD PEOPLE but they do SHADY BUSINESS I'll never go Back, I don't care if it's Free, no thanks"
"We at New Age Automotive take pride in our offered services. We are licensed and certified,as most of our customers can attest to that. Mr.Robertson came to our shop with multiple drivability issues, and was advised of the priorities, ie...coolant leak and overheating. We gave an estimate and advised that the remaining issues would need to be addressed after the coolant leak and overheating issues were resolved. Automotive repair is not cheap and yes you can spend $800.00 on 1 issue and still have other issues,as vehicles are very high-tech and therefore expensive to repair. This was explained to Mr. Robertson in advance. Mr. Robertson has lost his job and times are tight, and we can relate to that. But that does not mean that we can give work away. Not one time did Mr. Robertson tell me he was dissatisfied, or unhappy, with our work. Not even a phone call to try to resolve the matter. He left our shop, and was in no way noticeably unhappy. In fact, he commented that he would call to schedule the remaining work. Then, all of this and still no contact with me or members of my company? I do believe if this was true and happened to me I would have at least tried to resolve the matter with the shop owner, before slandering him. We have always helped our customers out, that have fallen on hard times, and will continue to do so. I regret that Mr. Robertson feels this way, but we did nothing wrong and tried to help out as much as possible, but we can only help so much. I believe Mr. Robertson is borderline slandering my company, without cause, and I believe my loyal customers, AND future customers will see the same and hope to move on, as this is a complete fabrication of what really happened.I guess you really can not please everyone but we will continue to try. Hope everyone has a blessed day! Thanks, Russ Dodson"
"Russ is an excellent mechanic and will fix it right the first time and Dawn insures the correct parts are ordered for the job and that you will be invoiced correctly." "I would tell them that they are very customer oriented and go above and beyond regular customer service. I had my vehicle towed thereafter hours and Russ stayed there until I got there with the tow truck. It was pouring rain! He fixed my vehicle in record time! If you are looking for mechanic you can trust and does great work...New Age is your place !" "Very honest and good service! Upfront about what needs to be done and gives options on how to resolve issues!" "Great service with excellent pricing..."
"Excellent work. They are committed to the work they do." friendly service, and they stand behind their work! The total package!" "Russ is very thorough and knowledgeable. His son Gary is good at what he does also. Dawn makes sure all the paperwork side is completed and correct. I like the shop and followed them from Charlotte to Mt Holly because of the previous excellent service I received."